Many visitors to my page have commented on the size of the space I have for working, and it is a large space 13'6" long and nearly 2' wide, however the danger of such a large space is that it can be hijacked for purposes other than craft. Over the weekend and on Monday I had a major sort out of stuff, lots of unwanted papers, embellishments etc, which I send to the play therapists at the local hospital for the children's wards. so once I had done that, I cleared and started thinking about the 40th birthday card I had to make and a 'Sorry you're leaving' card. However having cleared away all the unwanted stuff the surface was more or less clear, I vacuumed the floor and went down to lunch. Pottered around and then went back upstairs to find OH looking at the vacant space. "You were going to sort the Christmas decorations weren't you", he said and "Let's get the stuff out of the cupboard, on to here and sort it all before it goes back into the cupboard" And this is why my work top looked like this yesterday afternoon when I took the picture. So the only evidence of any craft ever happening on there are the scissors and rulers a bits on the window sill, so nothing really crafty there except just seen it peeping out of the left hand corner is the Pergamano Christmas tree that Margaret made for us. I hung some really glittery earrings on it to decorate it. So just to get the craft into this page, I'll show you a card I made before OH took over the work surface. A week or so ago Margaret and i had a play day with masks and glitter paste, and i was really taken with her tree mask. Then when I was asked for a bereavement card for a gentleman, this seemed to fit the bill. Well that's all for now, so come with me kind reader to The Stamping Ground to visit our wonderful host Julia, and look at all the fabulous desks shared by other desker. Morning Chris. Uh oh! A bit more sorting and simplifying going on there, I see.... but you still managed that gorgeous card. Well done. Another play day would have to be next Monday or Tuesday, I think, as after that we are getting ready to go away. Maybe Thursday? But I'd be jumping up and down emptying and re-filling the washing machine. Can you bear to put up with that? Hardly dare breathe in case the holiday goes pear-shaped..! What shall we play with next time? Hi - I a sure I had a rubber stamp just like that tree that you say was a stencil. Takes me back a while to y early days but I am now wondering if I still have it - major looking session looming ahead I can see. I just wish I had as much space as you, I would not let it be used for anything other than my crafting - but then I would probably not be as eager to tidy away my equipment either. Mmmm... Food for thought. You do have a wonderfully large crafting space, but yes it looks like it was hijacked! Grrr. 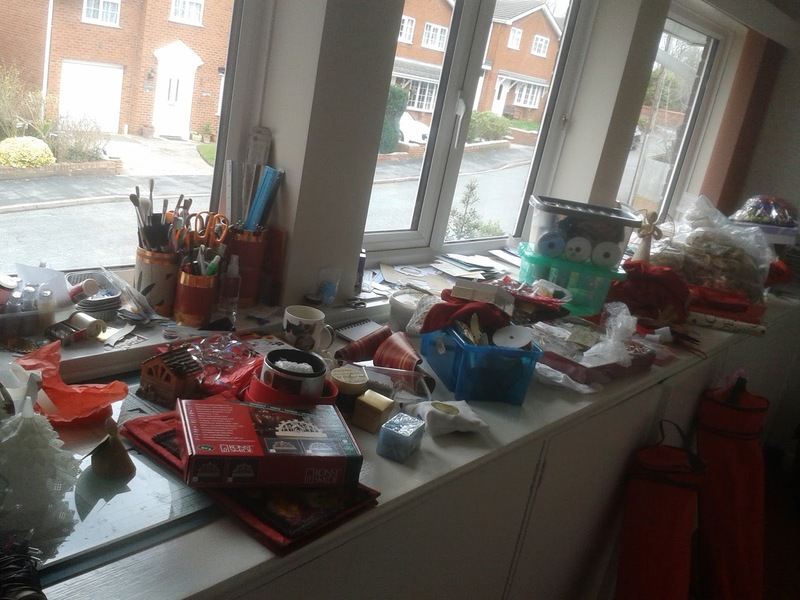 Our dining room table is like that and when I clear it off it seems to attract more 'stuff'. 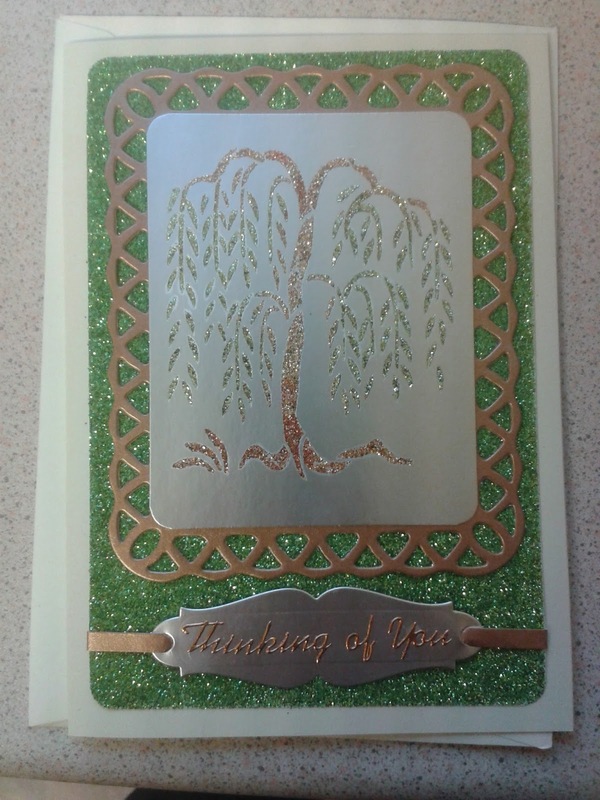 Beautiful card - very glittery and fun. Your dumping ground made me laugh...I've got a whole bedroom full of stuff at the moment!! Even my OH is sorting out at the moment and he's usually the one who hangs on to stuff...I'm a real repurposer of junk. I love that card, the tree image is beautiful and the sparkly stuff is gorgeous. Yes, Chris, you spelt that correctly in Dutch. Well done you. Your weeping willow certainly looks very appropriate and will be well received no doubt. Thanks for visiting and have a great easter weekend. What a fab space..hope you've reclaimed it now though!